I have a lot of t-shirts. Long sleeved, short sleeved, too small, too big…. I especially have a lot of oversized t-shirts that I like to wear as tunic dresses. Because I have quite a few, I find it difficult to style them without being repetitive. So, inspired by books such as Generation T and Youtube tutorial experts like itsblitzzz and secretlifeofabionerd, I decided to try my hand at some t-shirt reconstruction. I designed the weaving pattern myself, it is quite simple and if repeated a few times creates an interesting chevron stripe pattern on the sleeve. The best types of garments to work with for this project are probably cottons, jerseys, light knitwear…anything somewhat thin with a bit of stretch, that won’t unravel if you cut into it. Hope you enjoy this tutorial, feel free to comment or message me with any questions. And be sure to send me a picture if you try it out! **NOTE: When you get to the top of the sleeve, you can just cut the last loop and tie a small knot or bow. Or, use a few stitches to sew it up. I don't understand how the woven pieces stay woven.It looks to me like you make the cuts/slits, then overlap the thin strips of cloth between the cuts. zzbut if you don't stitch them afterward, how do they stay woven/overlapped?I don't get it>..? does this work on the back of the shirt too? I cant really do any of my sleeves because they're like "half-sleeves"
My daughter and I just did this on the neckline of one of her shirts, it is so cute! gonna try this for shore ! Maybe I'm confusing myself, but I could not figure this out! i LOVE this, but how do you end it?? 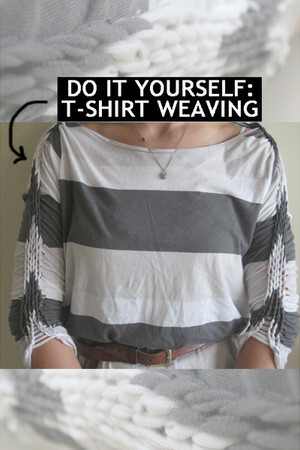 do you sew it or just tie it off somehow? I tried this & I can't believe how easy it was! I used a long sleeve, fitted jersey-type hoodie. I did both sleeves & all the way around the hood, & the neck. It turned out great! I'm having a really hard time with the video-please feel free to message me with questions and I will do the best I can to help you out! i know i'm about a year late in finding this, but if you haven't gotten the movie yet, try zamzar.com! Wow I love this. I did it to my striped nautical long sleeve and it looks awesome! Thanks! I love this, I have a lot of t-shirts so this will be great. Love this idea. I'm definitely going to try this one out. nice of you to post this! Everyone- I am working on a short video clip to help understand how to do the weaving- I will link it soon! Thanks for all the great feedback! looks good but I'm not sure how you pull the strips...any chance you'll make a video? can you please make a video! i tried it on a sock lol but i want to know how you ended it?? and made it the way you did if that makes sense?? tried it! but how do you do the multiple layers of chevron? i only got one row of them... do you do them next to each other?? what a great idea. Must to this.. Cute, I'm gonna have to do this! It could definitely make a boring tee cool and personal! Wow! That's cool! :) Thanks for the tutorial! Awesomeness! I must try this! I love diy though I mostly end up making a mess. Amazing. I can't wait to try this! oh, yes, sorry, forgot to add that. editing now... I just cut the loop and tied a little bow. amazing!!!!!! love this, you're so creative hun! This is so cool! Thank you for sharing and for starting a blog. oohh i cant wait to try this! amazing article ! i really want to try this! just need to find a top to use! I love love love loooooove this idea ! There's this shirt I have that i've been dying to do something about and now I've found the perfect thign, thanks so much ! defenetly a fav ! wow, such a cool article! SO COOL! I'm so doing this! Chic Rewards- Be Spontaneous & Get Creative!